1st Somerset Light Infantry, killed in action at Ploegsteert, December 1914. Cross Dimensions: Unable to measure. Detailing: Plain wooden cross with 45 degree bevel to the top of the shaft. Bottom of shaft is cut straight. 45 degree beveled ends to the cross beam. Painted detailing on the shaft and cross beam. Evidence of use in field: Damage to the top of the shaft, possibly resulting from the cross being knocked into the ground. Finish: Painted white, now very dirty almost grey in colour, with painted black text. Condition: Generally good condition. Paint finish is dirty with areas of peeling paint with some splits to the timber in particular to the right hand end of the cross beam. 2 holes in the cross beam with small area of damage to the lower left hand beveled edge to the cross beam. Left hand hole has partially obliterated the P and T in CAPT. Hole in the lower part of the shaft partially obscuring the words KILLED and ACTION and presumably obliterating the word IN which is no longer visible. 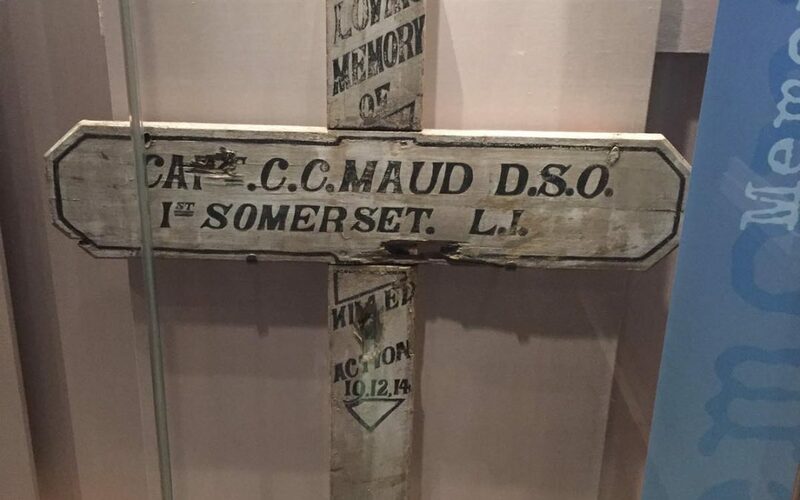 Other Information: Cross currently on display in the Military Museum in the Museum of Somerset, Taunton. believed to be 6th Somerset Light Infantry, killed in action near Ypres in September 1915. Detailing: Plain wooden cross with irregular 45 degree bevel to the top of the shaft. Bottom of shaft is cut straight. Irregular cut and damaged ends to the cross beam. Painted detailing on the shaft and cross beam appears to be Stars and dots with a three pointed crown or Fleur-de-lis detail under the date on the shaft. Evidence of use in field: Damage to the top of the shaft, possibly resulting from the cross being knocked into the ground. Bottom of the shaft is damaged where is appears to have been broken off. Finish: Plain timber finish with black text. Condition: Poor condition. The timber is extensively damaged and splintered. The cross beam is broken and has been wired to another piece of sawn timber which has been nailed to the shaft, thus obscuring some of the text. Much of the text, in particular to the cross beam has been obliterated where the timber is damaged. Damage to cross supposedly due to bullets according to the information next to the cross. Maud’s grave marker in situ. 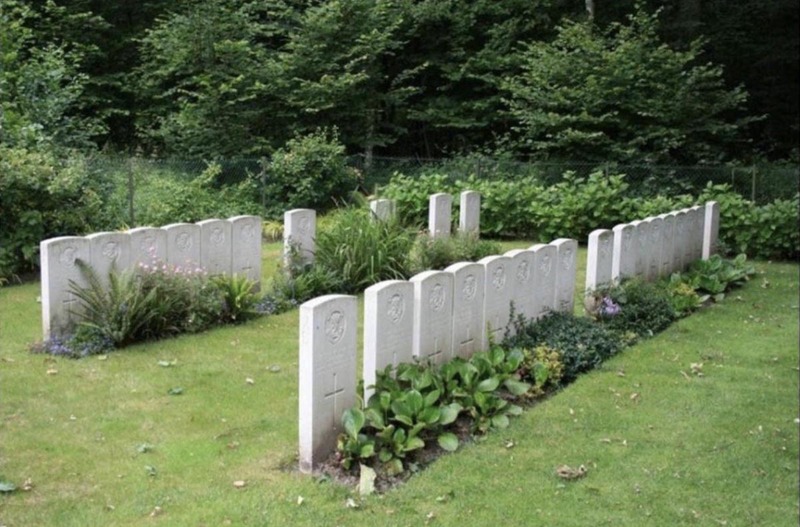 the group of graves are of the men buried on Christmas Day 1914 during the Truce in Ploegsteert Wood and mark the start of Ploegsteert Wood cemetery. 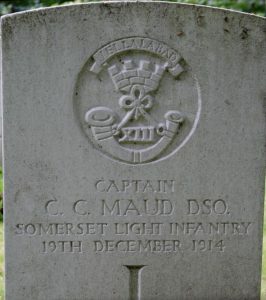 Capt Maud’s body was returned by the Germans as he had made most progress towards their wire during the failed attack on the ” Birdcage” on 19th December. They commented on his bravery. 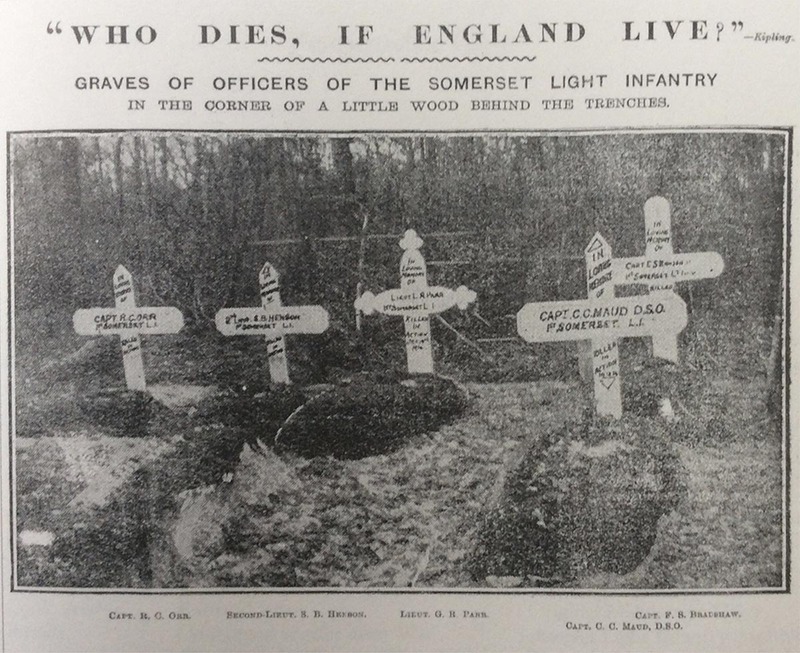 The black and white photo shows the graves including Capt Maud’s in their original position. News photo is from the Somerset Light Infantry archive and is from an appendix the Brian Gillards book “Good Old Somersets” it looks as if it was originally in a newspape. You may be interested to know that Cpt. Skrine was posthumously honoured with an unique cross, which is to be found off the Zonnebeke Road, to the north of Ypres. The cross mentions the same details, and “25th September 1915” as the exact date of his death. 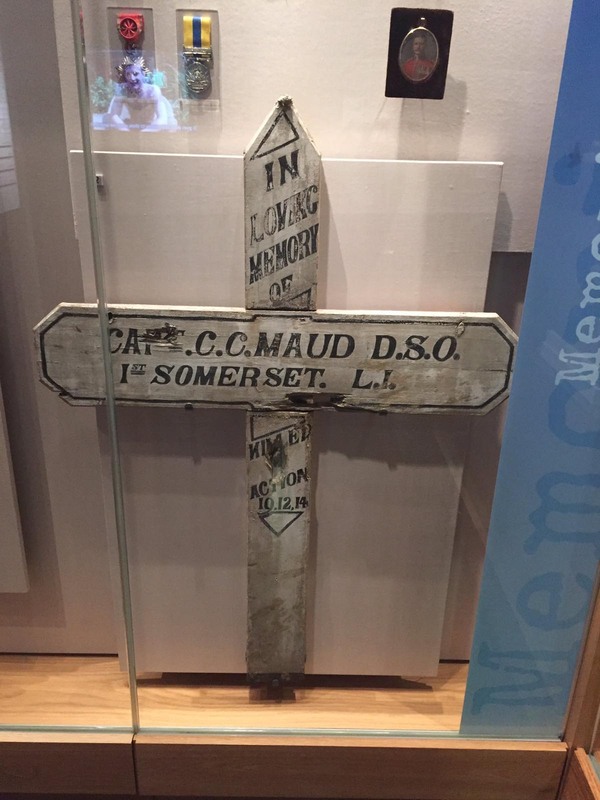 The cross bears the typical Latin inscription ‘Dulce et decorum est pro patria mori’, which reminds one of Wilfred Owen’s poem of the same title. 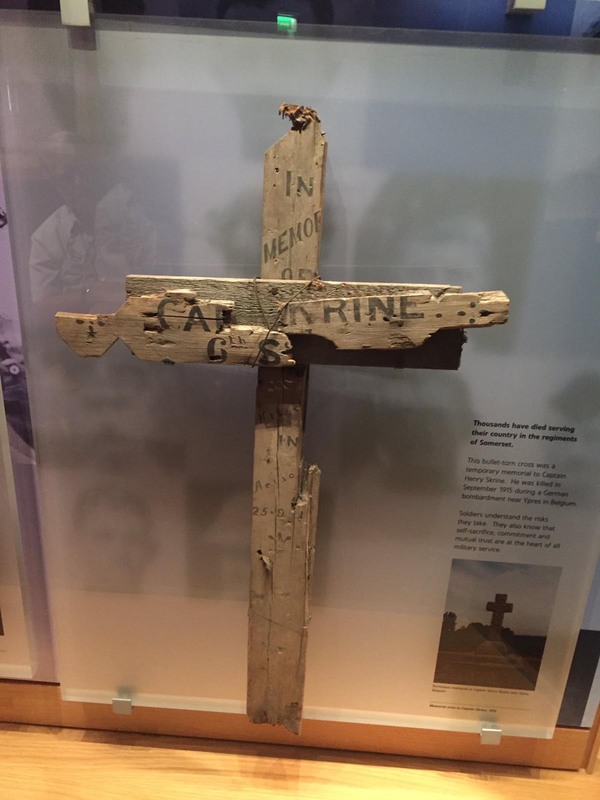 If the museum staff are interested, I can always send you a picture of the cross upon your request. author and member of the board of the Friends of the In Flanders Fields Museum, Ypres. Hi Chris, Thanks for this, a photo would be great. There was recently a discussion about just this on twitter. I believe his grave was lost and the wooden cross found in the vicinity which is the area of the stone memorial. Capt. Henry Skrine was a member of a prominent Somerset family, long associated with Claverton — a Parish near Bath, in North East Somerset. His name is listed on a war memorial inside our Parish church, alongside that of other local servicemen who died in the war. To commemorate the centenary of the Great War, a group of Claverton residents began to research the memorial and the men remembered on it. We have been able to find some information for all of them and have put together a hand-bound memorial book that is permanently displayed in the church, under the wall plaque. We would be very grateful if you could let us have a copy of the special cross that you mention.